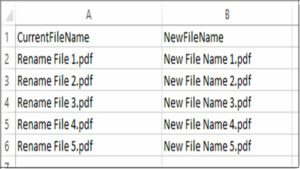 Earlier this week, I received a request to provide a quick and easy way to rename a list of files in a specific folder. 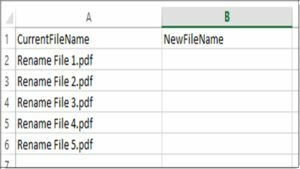 Each month, the user gets a bunch of PDF files placed in this folder, then needs to manually rename each file for downstream use. As you can imagine, this is a very tedious task, which must be repeated each month. This is a great candidate for automation. Luckily, Excel has a built-in statement to achieve this task. The “Name” statement renames a disk file, directory, or folder. Combined with a For Each Loop and some parameter manipulation, the task of renaming files takes no time at all! The following example illustrates this technique. strPath = "C:\BuffaloBI - Post Content\TestFiles\"
As you can see, the files are renamed to the desired text in a split second! Please modify the above code to suit your needs. Note: This example was created in Excel 2013. Thanks for the post, this is close to what I’m trying to accomplish. Would it be possible to prompt the user for a path, list the files in selected path, then give user ability to rename the files and select a destination path? I am working on a new post and will send you an update with link when complete.